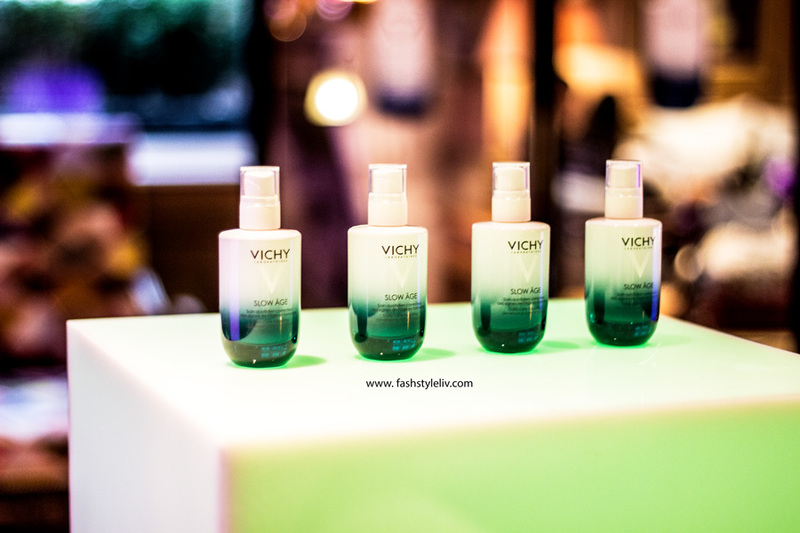 I recently wrote about the Vichy Idealia Peeling (review) which I was lucky to be gifted at the Vichy UK launch last month. I promised to talk about the Vichy Slow Age in another post and here it is. I have been using the Vichy Slow Age for more than 6 weeks and I thought it will be a good time to share my thoughts on it. 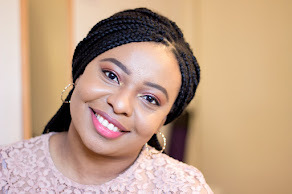 These days any beauty product that has anti-ageing or anything relating to age on its packaging is always scrutinised because people are more aware of skincare products and their claims. I have never been against ageing but I definitely want to age well. I also don't want to age prematurely. There are many factors that predispose people to ageing prematurely such as UV damage, free radicals in the environment, stress, diet, lifestyle, genetics, etc. We cannot control everything but if there are some factors that I can control like a healthy lifestyle and taking care of my skin, I am all for it. 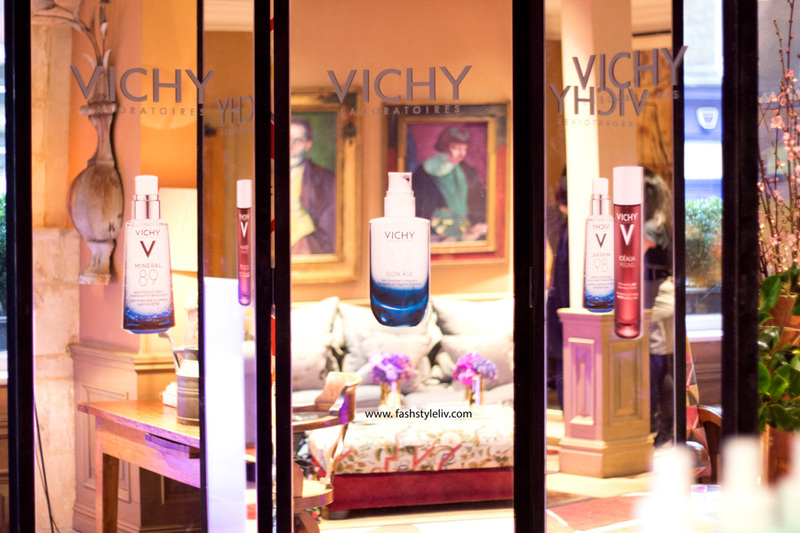 Vichy have made ageing well as a key part of their approach with the introduction of the new Slow Age. I love this approach of moving towards ageing well and preventing premature ageing as opposed to saying anti-ageing. This shift to "Slow Ageing" is inspired by the "Slow Movement" which is basically the concept of doing things at the right pace in order to do them well and to obtain the best results. 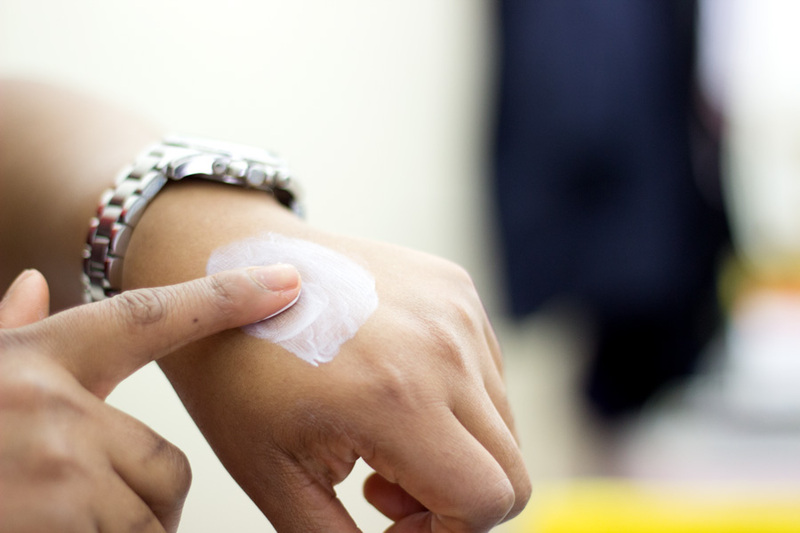 When this is applied to skincare, it literally means protecting the skin for the longer term benefits. Vichy Slow Age has been formulated by the renowned Vichy laboratories where they have combined three naturally active ingredients and broad spectrum filters (against UVA + UVB). 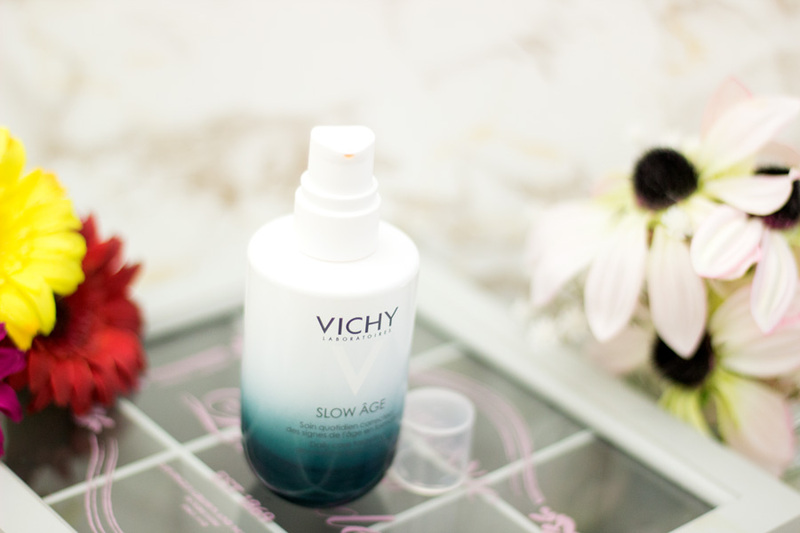 Apparently, the Vichy Slow Age's unique formula has been scientifically proven to slow down the appearances of ageing signs. I absolutely enjoyed learning about the research behind its production at the launch and I was very keen to try the Slow Age for myself. 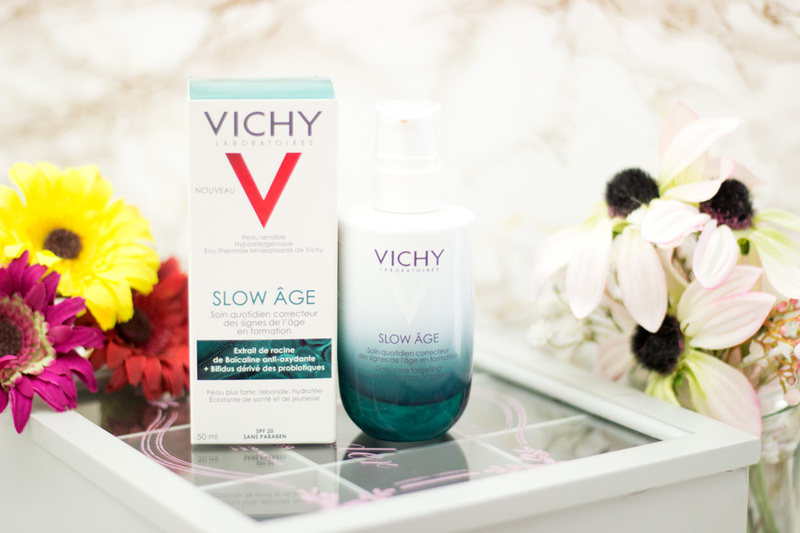 There are three products in the Vichy Slow Age range and they include the Slow Age Daily Fluid* (for combination skin), Slow Age Daily Cream (for dry skin) and the Slow Age for the Eyes. All Vichy Slow Age range products are Paraben-free and Hypoallergenic (tested on sensitive skin under dermatological control). Vichy have gone above and beyond fantastic when it comes to the packaging of their most recent launches. The Slow Age comes in the most incredible bottle ever, complete with a pump. The outer packaging is beautiful and the bottle inside is just so gorgeous. It comes in a sturdy glass bottle and I can tell you it is very weighty. I love the colour theme as it reminds me of the ocean. As it is a sturdy glass bottle, it is not travel friendly as you would imagine. The glass bottle is opaque so you can't really tell how much product you have left but you can take out the pump and make a quick guess. You get 50 ml of product so it does last a decent amount of time as a little goes a long way. The three main ingredients in the Slow Age include: Baicalin, Bifidus and the Vichy Thermal Spa Water. Baicalin is a powerful antioxidant which has roots traced back to Traditional Chinese Medicine. The Baicalin, along with Vitamins C, E and the SPF 25, works to slow down an correct the signs of ageing by protecting the skin against daily aggressors e.g. free radicals in the environment. Bifidus is probiotic-derived and helps strengthen the skin's barrier function against factor that may weaken it like stress, UV and pollution. The Vichy Thermal Spa Water (from the volcanoes of Auvergne) is rich in 15 minerals and helps re-balance the skin's PH and improves the overall quality of the skin. As with majority of Vichy products, the Slow Age is fragranced and this fragrance was developed to mimic the fresh volcanic force of the Vichy mineral water and nature in general. It really smells gorgeous and if it was a stand alone scent, I will definitely pick it up. However, it is not an overpowering scent. 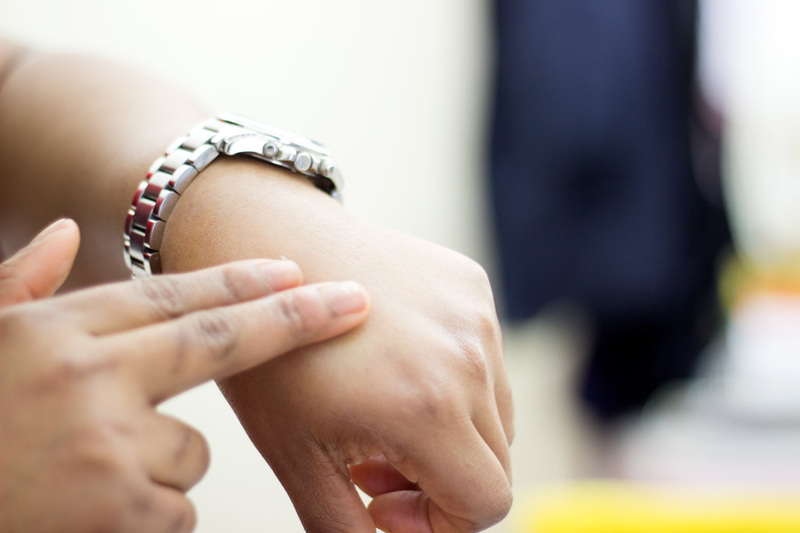 When I tried the Vichy Slow Age at the back of my hand, I thought it would be a thick formula because it looks like one. 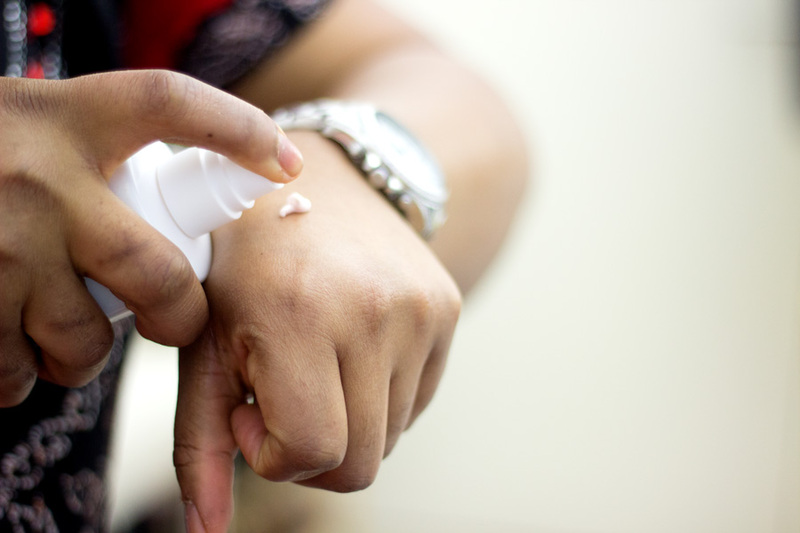 On the contrary, it is quite a lightweight formula once you massage it into the skin. It absorbs really quickly which is essential for me because I am always in a hurry in the morning and I have combination oily skin. It gives my skin a really fresh and evident glow but it's not shiny. My skin just looks radiant and healthy. It has a light peach shade but this colour does not appear on the skin once it is applied. The first thing I noticed when I applied it was the slightly cooling and refreshing feeling which I really like because it makes my skin feel awake. You can tell immediately that it is a hydrating formula because it does feel hydrating and moisturising on the skin. For my combination-oily skin, I find the level of hydration I get from the Slow Age is optimum but I feel if you have extremely dry skin, you may need to try their Slow Age Daily Cream which is optimised for dry skin. I have not tried that formula but I hear it is a really rich formula. While I don't think six weeks is enough time to comment on its slow ageing properties, I thought I will still share some of my results. I love that the Vichy Slow Age contains SPF 25 and yet it does not leave me with a blue/white cast, greasy residue or any flashbacks. I am really impressed and I can wear the Slow Age as my main moisturiser and know I am covered for the day. No matter how much I layer it on my face, it never feels heavy, greasy or unwearable. 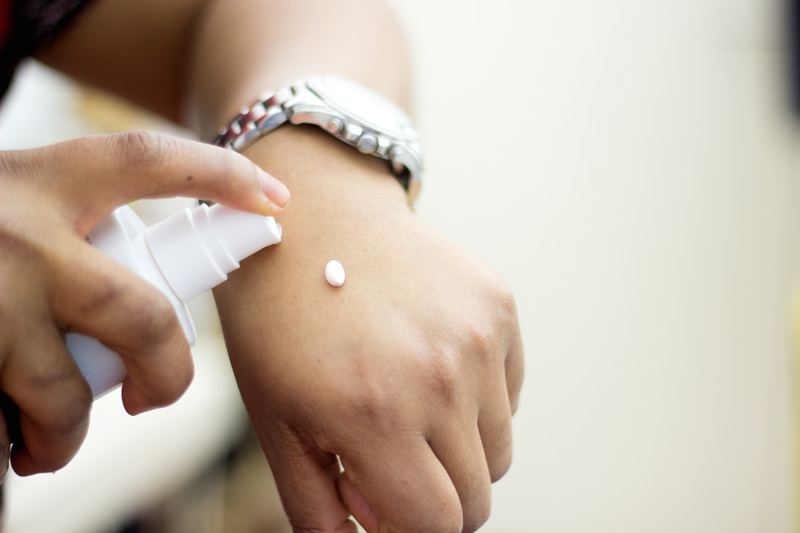 You all know that my favourite Sunscreen is the LRP Anthelios XL but I have used the Slow Age alone for a good while and I am loving it. My hyper-pigmentation marks have not got any darker and that's how I know that I am getting adequate cover from my sunscreen. It has worked so well as daily moisturiser for me and I don't have the need to use anything else on top of it because it provides all I need in a moisturiser- hydration and moisturising my skin. My skin really does look and feel fresher. I have used it everyday since it came home with me and I still use it till this day along with my Vichy Idealia Peeling. I believe Vichy Slow Age will be sold in Boots but I can't find a link for now. I found it on FeelUnique so that's the link I have used for now. I will update this post when I find other links. The good thing is it is on offer at FeelUnique so it's happy days all the way. I have quite a few moisturisers but if I use one consistently (especially past my usual 4 weeks skincare trial/review period), then it is pretty special. The Vichy Slow Age is one I have absolutely enjoyed reaching for and I know it will be a staple part of my routine. If you are looking to try a new daily moisturiser that ticks all the boxes and works well as a sunscreen too, I'd recommend trying out the Vichy Slow Age. The only regret I have is that I can't travel with this gorgeous bottle so I have to dispense it in a small tub. I hope you enjoyed this post and I'd see you in my next one. 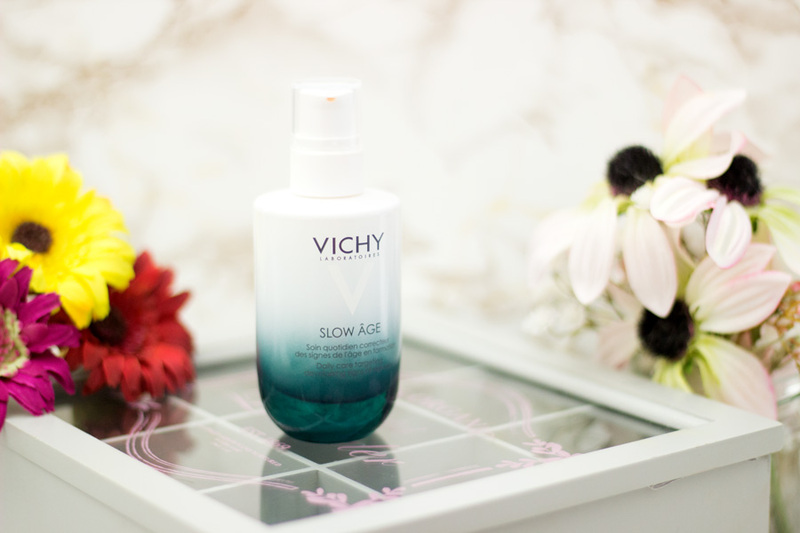 Have you tried the Vichy Slow Age? *Gifted PR Sample + Affiliate links, read my full disclaimer here.